The 2002 General Election was held on the 17th of May. World Cup Fever wasn’t quite at its height as the Roy Keane Saipan saga didn’t fully start until the 21st of May. 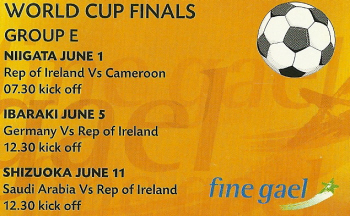 This is a card from Fine Gaels Paul McGrath with his details on the front and the world cup fixtures on the reverse. 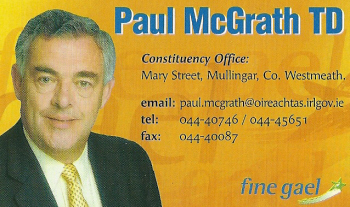 A number of candidates produced similar cards. The TDs namesake had retired in 1998.